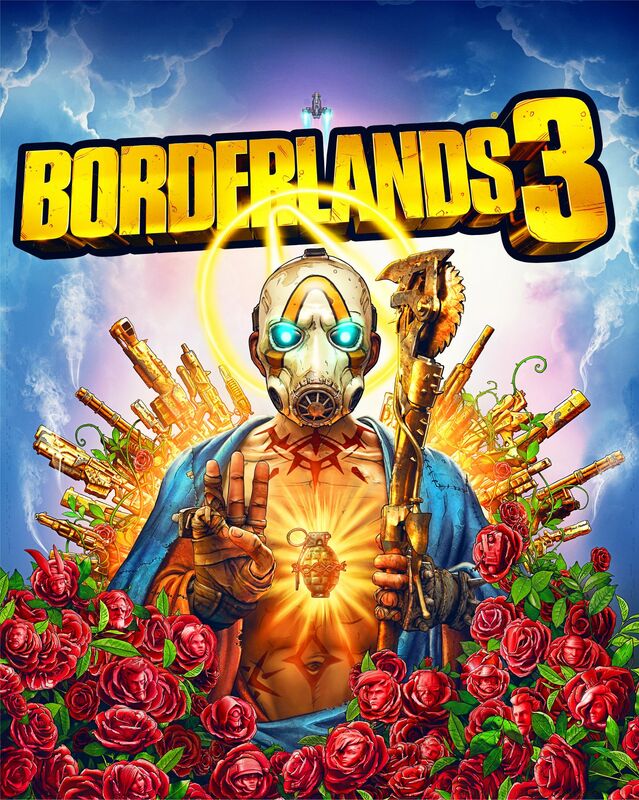 If you have been keeping up with Borderlands 3 news, you have no doubt seen the box art. It’s the messianic psycho holding up three fingers, surrounded by roses and golden guns. A lot of the roses have the faces of central and supporting characters, in a Cabbage Patch Kids sort of way. Gearbox has released a new 4417 x 5528 image of the box art for us all to dissect. While it may be the same at a glance, this image has a few new Borderlands 3 secrets for us to feast our eyes on. 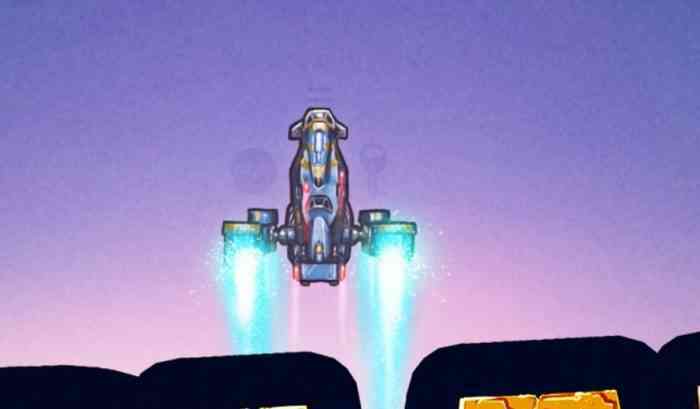 Starting at the top of the image, the rocket blasting off has a couple of symbols at its side. To me, the one on the left looks like an emoji-looking moon. The one on the right appears to be a key. Without really forming any theories, the significance of these symbols might be that Pandora’s moon Elpis had a Vault on it, and keys or Vault Keys are used to open Vaults. There also appears to be an = above the ship. Are these symbols even what I think they are? I don’t know, the smudges on my monitor might make them appear different. In the middle of the image, there are letters and numbers visible on the golden guns. Put together in the right order, they form a Shift Code for Borderlands 2. 5B3BJ-XZWFW-T3KRZ-JBJTB-6WST9 gives players Maya’s Last Call skin. On either side of the image we can see two Morse Code messages discovered last week. 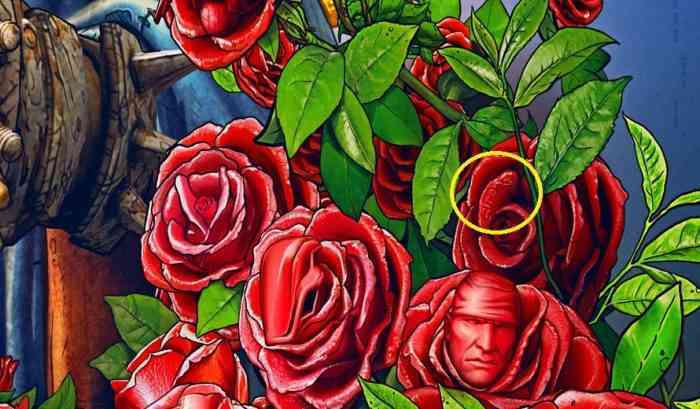 On the right hand side of the image, the word “Sirens” is hidden in a rose petal. For Borderlands fans, the importance of Sirens should go without saying, but the very first hidden message in the Mask of Mayhem teaser spelled out “Count the Sirens.” Is this the first “Sirens” we should be counting? Is Gearbox going to feed us “Sirens” from now until September 13th? Finally, at the bottom right hand corner of the image, a set of numbers can be seen. 23541514201955111156191143202111825 2 is a cipher with the digits corresponding to letters. Decoded, this reads “We don’t speak of Sanctuary 2.” Sanctuary is the floating city in Borderlands 2. Is there a second one? We’ll probably have to wait until September 13th when Borderlands 3 launches on PS4, Xbox One, and PC via Epic Games Store. Where do you think these breadcrumbs lead? Let us know in the comments below.